The existing synteny block reconstruction algorithms use anchors (e.g., orthologous genes) shared over all genomes to construct the synteny blocks for multiple genomes. This approach, while efficient for a few genomes, cannot be scaled to address the need to construct synteny blocks in many mammalian genomes that are currently being sequenced. The problem is that the number of anchors shared among all genomes quickly decreases with the increase in the number of genomes. Another problem is that many genomes (plant genomes in particular) had extensive duplications, which makes decoding of genomic architecture and rearrangement analysis in plants difficult. The existing synteny block generation algorithms in plants do not address the issue of generating non-overlapping synteny blocks suitable for analyzing rearrangements and evolution history of duplications. 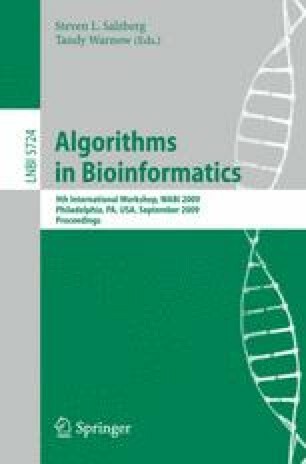 We present a new algorithm based on the A-Bruijn graph framework that overcomes these difficulties and provides a unified approach to synteny block reconstruction for multiple genomes, and for genomes with large duplications.